The church is located in one of the most multicultural cities in America, yet the congregation was not as engaged with its diverse neighbors as it could have been. That changed when they hired an associate pastor to live in intentional community in apartments three miles and a whole world away. Update: The Rev. Hannah Terry serves as founding executive director of FAM Houston and associate pastor at Westbury UMC. She also serves as community pastor at St. Mark’s UMC and is working to replicate the FAM model with St. Mark’s in The Heights and Near Northside neighborhoods. On Easter Sunday 2015, 10 middle schoolers stepped forward with their sponsors, some to be baptized, and all to profess their faith and join Westbury United Methodist Church in Houston. It was one of the largest confirmation classes the church had seen in years. For four of the class members -- and for Westbury -- the journey of transformation to that Easter morning had begun years earlier and halfway around the world. You could see it in the brightly colored African-print clothing the boys’ family members wore as they stood with them before the altar. You could hear it in the boys’ names as they rang out in the packed sanctuary when the candidates were presented for confirmation. The boys and their families are refugees who had resettled in Houston just two years earlier. 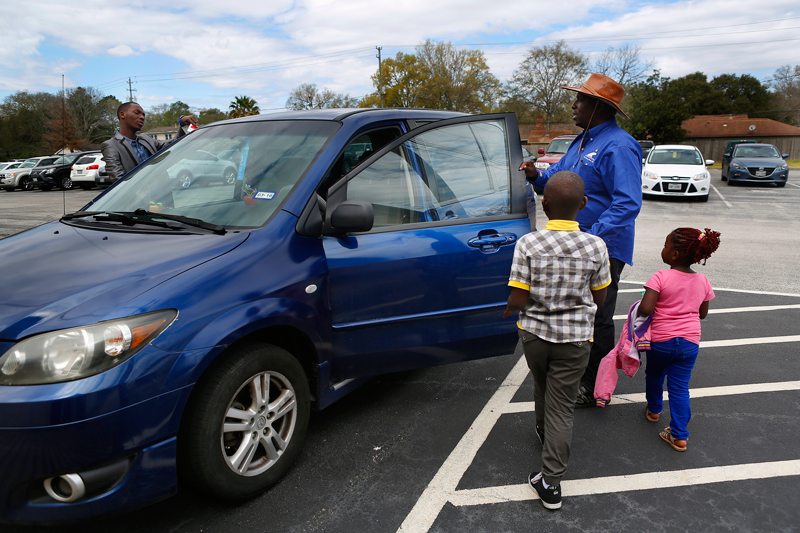 They are some of the 40 to 50 African refugees who now worship at Westbury, a church that was planted in 1955 amid new suburbs sprouting up in southwest Houston. For Westbury, the boys and the other African refugees are signs of new life after years of decline, the literal confirmation of a long process of self-examination and change. Under the leadership of two successive pastors, a fiercely protective bishop and a risk-taking associate pastor fresh out of divinity school, Westbury has worked to shift its focus over the past five years. 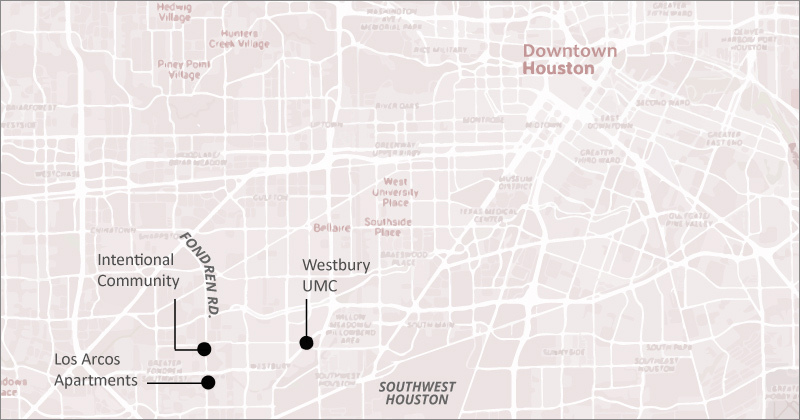 Reclaiming and building upon its long history as a diverse congregation, Westbury leaders have been asking, “Who is my neighbor?” and, “Where is God already at work?” in a Houston vastly changed by immigration, a city that is now the most diverse metropolitan area in America. 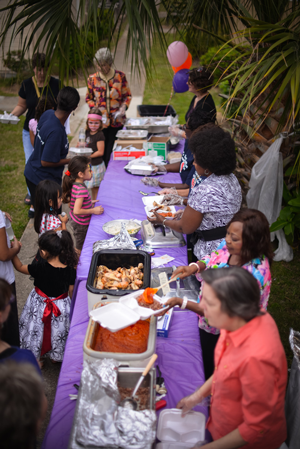 Clergy and lay leaders have been finding answers just three miles away in a place they had long overlooked: a neighborhood called Fondren Southwest, along Fondren Road, a busy four-lane thoroughfare that spans southwest Houston. There, they have discovered, God is at work in several 1970s-era apartment complexes that now house low-income residents, mostly immigrants, including refugees fleeing war and violence around the globe. Rehabu Mukanya and her brother Vianney receive communion. Moise Mukanya, James and Mary Arthur and John Henry Coker meet for Sunday School class at Westbury UMC. Emile Nsengiyumva carried this well-worn, French-language Bible through the refugee camp in Rwanda. Nusura Mtendamema, Feza Mukagatare and Andrew Kragie visit on the way to the parking lot after Sunday worship. In particular, they have been finding answers in relationship -- friendship -- with refugees from Burundi, Rwanda and the Democratic Republic of Congo who live in Los Arcos, a 516-unit complex on Fondren. 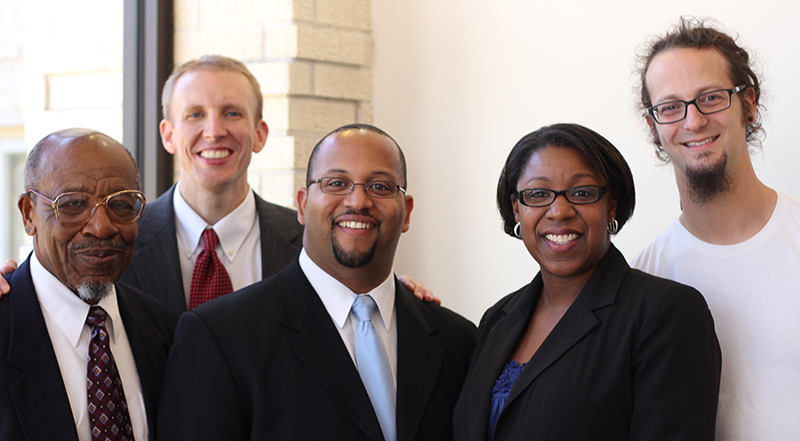 Westbury hired a new associate pastor, the Rev. Hannah Terry, who, with a young couple from the church, moved into the Fondren Southwest neighborhood to live in intentional community and get to know the people living nearby. They call their work the Fondren Apartment Ministry, or FAM. Not every congregation can do ministry with refugees, writes Hannah Terry. But every church can show up in their community and see where God is already working. For those looking to learn from Westbury, the congregation’s story is not so much about being in ministry with refugees as it is about embracing a process of change. At a deeper level, Terry said, it is about being present, listening and discerning where God is already at work in the world, in a particular place and context, and then joining in. “All churches may not be able to be in ministry with refugees, but all churches can do that,” Terry said, referring to the process of change. This new ministry provided an avenue for movement in both directions -- for Westbury to go into the community, and for the community to come into the church. Moise Mukanya, 53, and his family have worshipped at Westbury since August 2013. Originally from the Democratic Republic of Congo, Mukanya arrived in the United States after nine years in a refugee camp in Burundi. He has found a church home at Westbury. Ruhumuriza and his father don’t talk about it much, but they are survivors of the Gatumba Massacre, in which Hutu rebels killed and injured hundreds of Tutsi civilians in a refugee camp in 2004. He was nearly 11 when it happened -- about the same age as the boys in the confirmation class. Of the four, three were Hutu and one was Tutsi. Now, they were all members of Westbury. The Rev. Tommy Williams attended Westbury as a teenager in the 1990s, when his mother worked at the church. Back then, 600 to 700 people worshipped there. That was about half the number from Westbury’s heyday in the 1960s, but still, there was a vitality about the place. But when he returned in 2010 -- this time as senior pastor -- years of decline had taken their toll. When he looked out from the pulpit each Sunday morning, the 700-seat sanctuary was mostly empty. The two services combined drew only about 300 people. The church was adrift, Williams believed, no longer clear about its mission. As numbers and giving had dropped over the years, Williams said, the church had become more inwardly focused, losing some of its evangelistic impulse. Because many in the church knew and remembered Williams and his family, he had immediate credibility with his new congregation. Not long after his arrival, Williams led the church in a process of discernment, spurring members to ask themselves who and what God was calling them to be. What were the church’s gifts? How would they use them in ministry? Each Sunday in September 2010, Williams preached on discipleship, ministry, mission and worship with all people. One night a week, people met in homes to study and talk. They pondered Williams’ challenging questions about Westbury and its future. Later, a discernment working group considered what members had learned and drafted new vision and mission statements and core values. The process helped clarify and articulate one of Westbury’s core values: its history as a diverse community. That, they realized, was the church’s gift. How can diversity shape our life together? 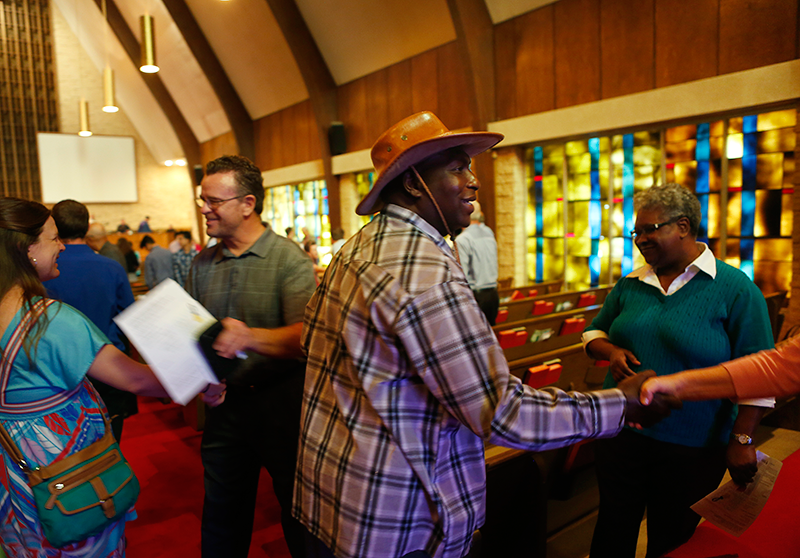 For three decades, Westbury had been a racially diverse church -- one of the most diverse United Methodist congregations in Texas. Westbury had begun to attract African-American members in the 1980s and, since then, had had several African-American senior and associate pastors. 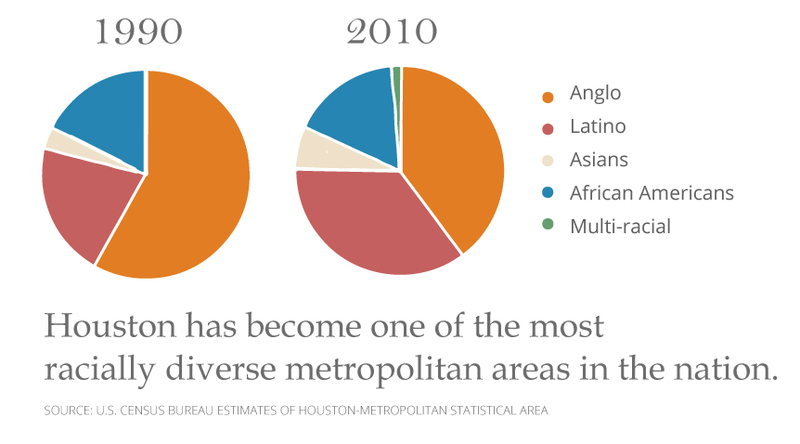 In 2010, its members included not just Anglos but African-Americans and African immigrants -- doctors and other medical personnel who had moved to Houston to work in the city’s growing health care sector. Yet that diversity was not shaping the church’s life together in any real way, Williams said. It did not inform the church’s approach to mission or discipleship. "Is God calling us to do something?" It was more like wallpaper or the church’s 1960s A-frame architecture, just one of many features of Westbury. Sunday worship, for example, was still a traditional Anglo United Methodist service, Williams said. The mix of people and cultures wasn’t reflected in its music, liturgy or prayers. The discernment process persuaded the congregation to change that. “We decided quite clearly that God had gifted Westbury with this diversity, and so we began to discern, ‘What is it about this gift that should shape our life together?’” Williams said. They began with Sunday worship. 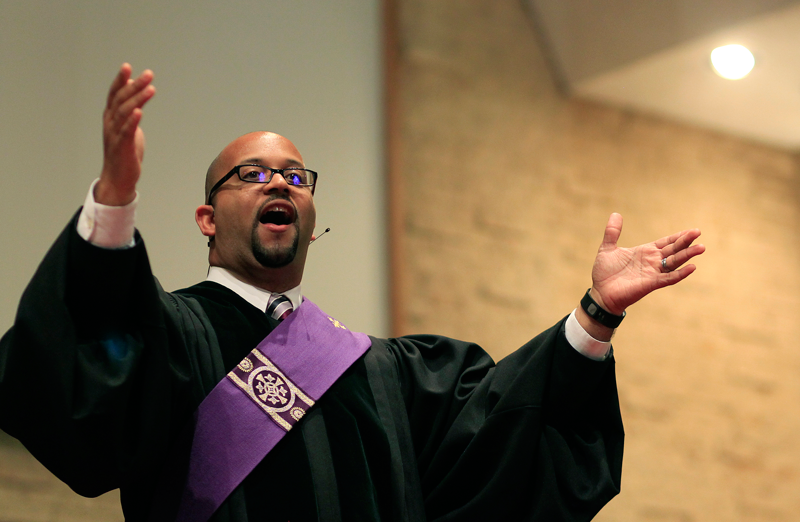 In 2011, the church hired a music director with a passion for cross-cultural worship, the Rev. R. DeAndre Johnson, and moved to a single Sunday service. 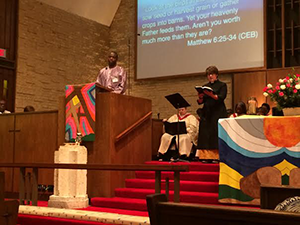 Ever since, Westbury’s worship has featured an eclectic mix of music, ranging from Wesley hymns to African songs, from black gospel to Spanish hymns. More changes followed. 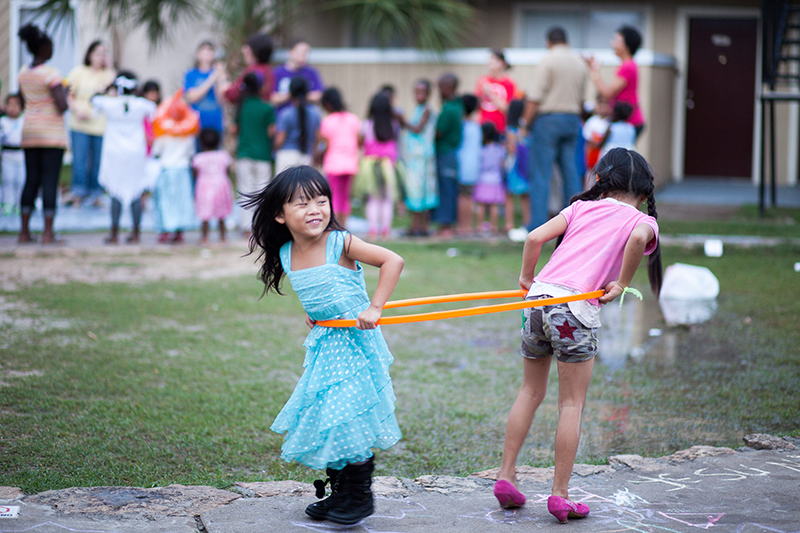 The church established a volunteer partnership with a nearby elementary school that served mostly immigrant children. 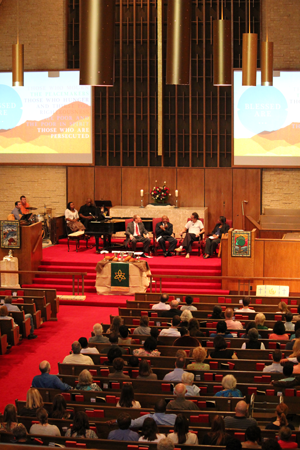 They brought in Shane Claiborne and John Perkins to lead a discussion about race and reconciliation. The changes, particularly with worship, had a mixed reception. Membership, which had jumped to 400 shortly after Williams arrived, dropped once again to 300 or so. Most of those who left drifted away with no explanation, but a few were upfront about it, telling Williams they preferred traditional worship. “Singing in ‘Kenyan’ is a struggle for me,” one man told him. But Williams tried not to worry. About the same time, the discernment group began seeing signs that made them wonder whether they were being called to a new ministry. One day, the church receptionist buzzed Williams in his office with a call from an apartment manager at one of the large complexes on Fondren Road. A violent crime had occurred at her complex, and she was asking whether someone from Westbury would come to the apartments and lead a Bible study. “I was moved by her call, but I didn’t know at the time where that would go,” Williams said. For various reasons, the Bible study never happened, but the woman’s call piqued curiosity about the apartment complexes and the people who lived there. About the same time, Nusura Mtendamema, a woman from Burundi who lived in one of the Fondren complexes, began attending Westbury. Mtendamema became a key connection between the church and the people living in the apartments. Westbury members and leadership began to understand as never before that Houston had changed dramatically. And they were right in the middle of it. Texas Annual Conference Bishop Janice Riggle Huie, who is based in Houston, supported the congregation’s desire to take action. “We need to learn how to connect with the new Houston, the new people of Houston,” she said. The church knew it would require a leap of faith. They’d never done a ministry like this before, and weren’t quite sure how it would work. They were not a wealthy congregation. Westbury was in the middle of its budget year, and money was tight after years of decline. But with financial support from the Texas Annual Conference and donations from members and others, the church decided to move ahead. They decided to start by creating a new full-time ministerial position. And that person would live and work in the Fondren neighborhood. Terry fell in love with Westbury’s story the first time she heard it. When she met with Westbury leaders for her job interview and they told her about their plans for the Fondren Apartment Ministry, it sounded like what she had been dreaming about. The previous summer, she had ministered in a field education placement at New Song Community Church in Baltimore. New Song had grown from small and fragile roots planted in 1986 when three people -- Mark Gornik, along with Allan and Susan Tibbels -- had moved into the area and simply lived there. That summer, Terry discovered her call: to be in a neighborhood parish and do community development over the long haul, “listening with others to the Holy Spirit” and working on problems that don’t allow for quick fixes. Now she’d been hired to do exactly that. Her first day on the job, Terry could hardly contain herself. It was June 1, 2012, barely three weeks since she had graduated from Duke Divinity School. 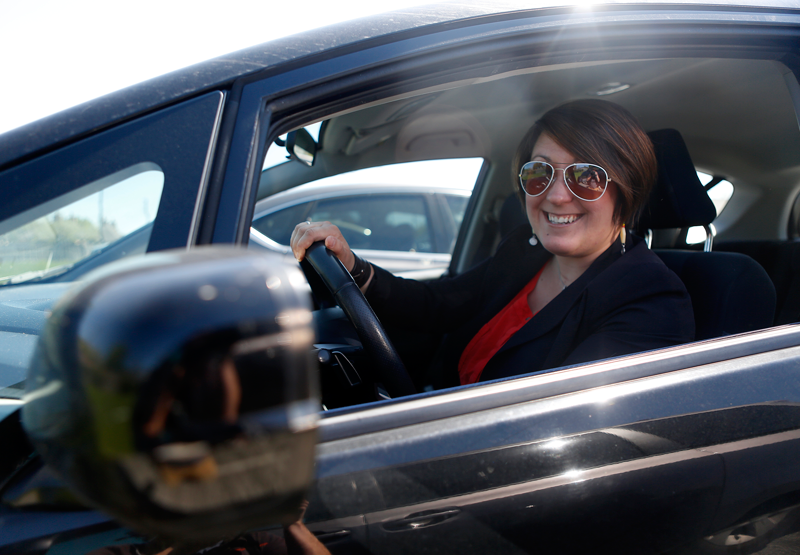 That morning, she’d bought a brand-new car: a black Honda Fit she named Pearl. By midafternoon, she and Pearl were cruising down Fondren Road, surveying her new parish. Terry took in everything around her -- the flat, chaotic sprawl of no-zoning development, with mile after mile of apartment complexes interspersed with nondescript strip malls. 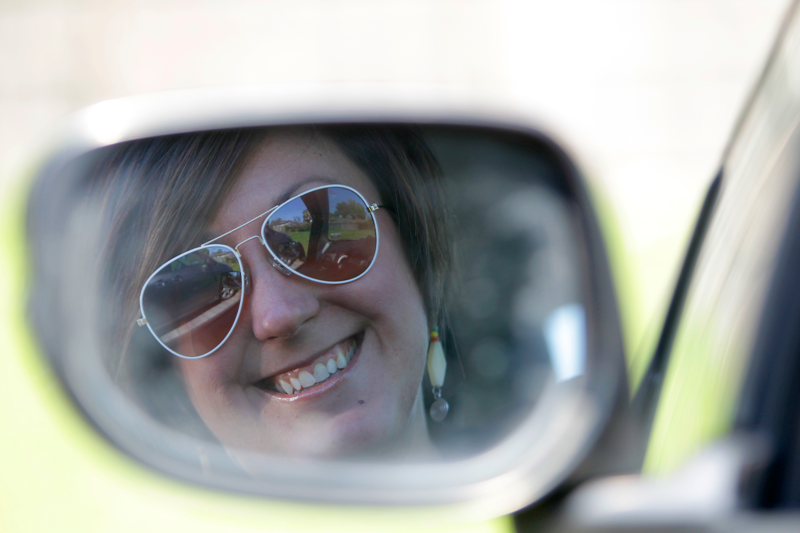 Alone in the tiny black car, Terry prayed and sang out loud, talking to God as she passed cellphone stores, a check cashing office, used-tire stores, tiendas and fast-food restaurants. Four days later, the bubble burst. In the extended-stay motel that was serving as her temporary home, Terry sat on the bed and cried. 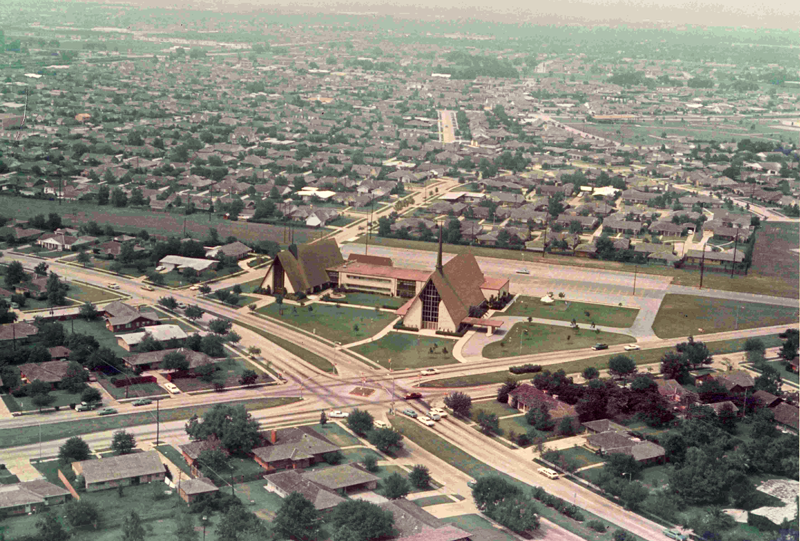 Houston was the fourth-largest city in the country, with almost 2.4 million people. She knew virtually none of them. What was she even doing in Texas? She was from West Groton, N.Y., a town of 2,400, where her dad was a Baptist pastor. Houston was different from anywhere she’d lived. It was busier and more fast-paced, at once cramped and sprawling. The sheer number of people living in the apartments along Fondren Road was mind-boggling. And it was hot. So hot. It was the first week of June and already 97 degrees. Worse, she had no idea what she was doing. Is this going to fail? What if it’s a flop? Is God going to be doing something with us? Terry dried her eyes, literally and figuratively, and with only the broadest of job descriptions, set out to learn all she could about the neighborhood and its history. For her entire first year at Westbury, she was a deliberate presence in the Fondren community. She spent hours driving and walking around the neighborhood, meeting people -- residents, community leaders, police officers, shop owners, apartment managers, case managers with refugee-resettlement agencies -- and listening to them. "We need to learn how to connect with the new Houston, the new people of Houston." At this point, the church did not have a specific plan or outcome in mind. Anything was possible. The ministry might become a house church. Or maybe a church plant or a storefront mission. Who knew? The only thing Terry was sure of was that she wasn’t there to recruit new members to Westbury. This would be a new way of doing church -- not old-fashioned outreach, with its implied superiority. “We don’t like the theological implications of ‘outreach’ that say, sort of, ‘Let us come and help you and fix you’ to another group of people,” Fuerst said. How can the church be there in the gaps? Soon after she arrived, Terry met Nusura Mtendamema, the Burundian woman who had been attending Westbury. Mtendamema, a community leader, provided a key entree into the refugee community. Though Mtendamema spoke little English, and Terry even less Swahili, the two became friends. Terry began accompanying Mtendamema when she applied for jobs or met with her case manager. The smallest tasks of daily life were so complicated. When Terry tried to help Mtendamema cash a paycheck from a temporary job, the effort was a complete failure. The tellers couldn’t cash the check, because Mtendamema didn’t have an account, and even if she opened one, it would be days before she could withdraw any money. They couldn’t set up direct deposit with her employer, because there was no guarantee Mtendamema would have the same job the following week. Three refugees share their stories. Terry felt awful for her new friend. The experience drove home the boundaries of race, ethnicity, class and socioeconomics. It also raised bigger questions about how Terry should be in ministry with people like Mtendamema. 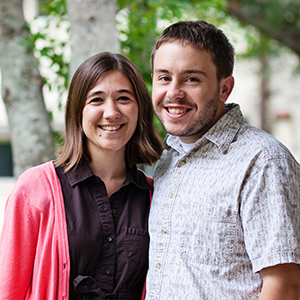 Even before Terry started work, Williams had approached a young couple, Daniel and Lindsey Heathcock, about joining her in a small intentional community in the Fondren area -- part of the vision for the new ministry from the outset. With the support of the Texas Annual Conference, Terry went to various programs on church planting. Four times a year, she attended the Academy for Missional Wisdom, learning how to start missional faith communities from the academy’s founder, the Rev. Dr. Elaine A. Heath. The Heathcocks and Terry spent a year getting to know each other, sharing meals at each other’s homes. 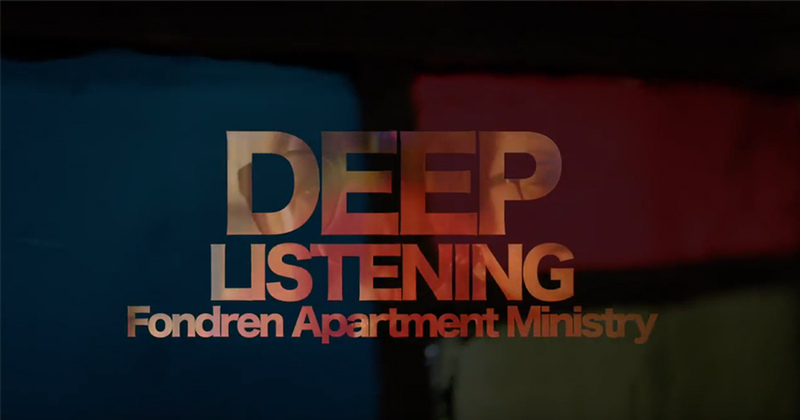 Slowly, through prayer and discernment, they began to sketch a vision for an apartment ministry and their life together. Early on, Terry and the others had decided to focus on one particular apartment complex -- Los Arcos. Mtendamema lived there, and Terry was already getting to know some of the residents. Built in 1977 to house young professionals in Houston’s oil industry, Los Arcos is a jumble of 30 to 40 nondescript two-story beige buildings. It’s now filled with immigrants and refugees from around the world -- from El Salvador to Eritrea, Burundi to Bhutan, Congo to Thailand and beyond. Terry and the Heathcocks wrestled with the question of where to live, finally deciding against moving into the Los Arcos complex. They felt it would be wrong of them to take up spaces that refugees needed. So in March 2013, Terry and the Heathcocks moved into another complex, less than a mile north on Fondren Road. The first few months, they were joined by Eric Mukuba, a young Congolese asylum-seeker from Dallas; eventually, Mukuba decided to move back to Dallas. They lived in separate apartments, but at 6 a.m. every Sunday through Thursday, they gathered for morning prayer, and on Sunday evenings shared a meal together. They adopted a rule of life to guide their small community. 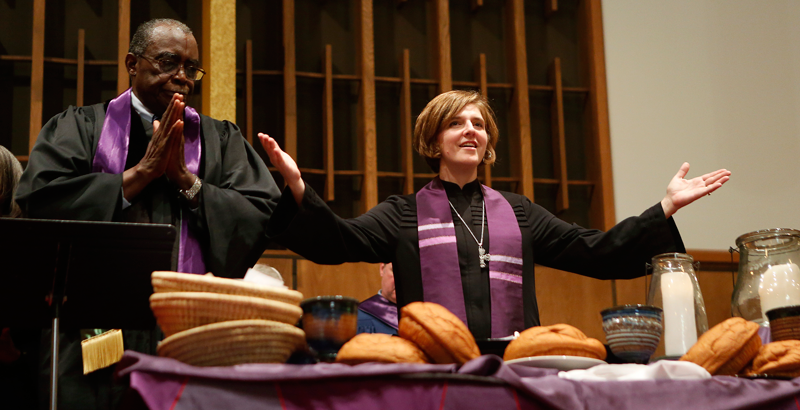 About this time, Williams was appointed senior pastor at St. Paul’s UMC in Houston. Fuerst replaced him; she too was enthusiastic about the experiment, committed to a ministry of presence, patience and the long, slow work of relationship building. A few weeks after the move, Terry and the Heathcocks invited some of the Africans Terry had met at Los Arcos to dinner at the Heathcocks’ apartment. About eight people attended; the next week, there were 16. And by the third dinner, 35 people crammed in together, eating, laughing and singing. Soon, they were hosting a weekly gathering on Wednesday evenings in the courtyard at Los Arcos. A mix of church, Vacation Bible School and sheer celebration, it drew mostly children at first, but then more and more adults. Over the next year and a half, the crowds grew to as many as 120 people, including Africans and others who lived at Los Arcos, as well as Westbury members. Afterward, back in their apartments, Terry and the Heathcocks would stay up late, talking and debriefing. Flopped down on a couch, a favorite chair or the floor, they’d process the evening’s events. Some evenings, they also came home stunned by the stories they’d heard. They met a man who lived in an upstairs apartment overlooking the courtyard. For eight months, he had lain in his apartment suffering from a gunshot wound that hadn’t healed. Although they helped the man get medical care, they were deeply disturbed by what he had been through. Again and again, as the ministry slowly unfolded, Terry and the others were surprised. Food was a constant issue at first. For weeks, Terry and the Heathcocks served one kind of food after another, cooking big pots of rice and beans, goulash, chili, and curry and lentils. But none of it was a hit, especially with the children. Food has always been part of Fondren Apartment Ministry. The worst failure was peanut butter and jelly. The three made 80 sandwiches and came home with 78. Finally, a leader in the African community offered a suggestion: try pizza. They did, and it was a huge success. From then on, every Wednesday became a giant pizza party, one that began with everyone in a circle, reciting the Lord’s Prayer over the savory feast. Terry and the Westbury leadership had tried to avoid having expectations about the ministry. But after only three months, the Wednesday events were going so well that Terry started to wonder whether the gatherings themselves might be their end goal. “Maybe this is the church,” Terry thought to herself. She was excited that in an era when the United Methodist Church and other denominations are searching for new ways of doing and being church, she might be part of creating an alternative. But after a Wednesday gathering in August 2013, Terry was brought up short when a dozen children crowded around her, tugging at her and jumping up and down. Terry was stunned. The one thing she and the Heathcocks had been certain of was that the Fondren Apartment Ministry wasn’t about putting “butts in the pews” to boost a flagging congregation, Terry said. It was an uncomfortable dynamic for Terry. God was already at work here, she knew. It was her job as a pastor to interpret the needs of the world for the church, not to save people’s souls by bringing them into her congregation. But as Terry talked with leaders in the African community and others, she began to understand. The refugees wanted to be part of life at Westbury. They had been forced to leave homes more than 8,000 miles away. After all they had been through, they wanted the safety and stability of a building and an established church. Within weeks, people from the apartments began going to church at Westbury. Because very few had cars, Terry organized Sunday morning car pools with church members. “That was a learning curve for me -- realizing that, yes, I’m a vision-caster, but I’m also learning, and need to be open to what is the vision of the people with what God is creating,” she said. A few months after the Los Arcos residents began attending Westbury, a dozen African women at Los Arcos approached Terry with a problem: they needed help learning English. Imfura Martha and Feza Mukagatare at ESL class. Crowding into an apartment at Los Arcos, they explained to her through a community leader that they were glad she was their pastor, and they trusted her -- and Westbury -- and wanted her help. The ESL classes they had been taking as part of the resettlement program presented many obstacles: they could be difficult to get to, often conflicted with their work schedules, required them to leave their children at home, and sometimes had long waiting lists, they said. “They knew that English was the gateway to life in America,” Terry said. Navigating the health care system. Buying groceries. Getting around Houston. Knowing which bus to catch. Difficult enough for any Houston resident, such tasks were nearly insurmountable without at least some ability to understand and speak English. It was a pivotal moment in the ministry, Terry said. People were naming out loud what they thought the Fondren Apartment Ministry needed to do and were approaching Terry as their pastor. It was a vivid example of what it means to be in ministry with people. Within a few weeks, Terry had arranged for Holly Welty, a Westbury member and ESL teacher, to begin holding classes in the Los Arcos clubhouse. Twice a week, Welty lugged teaching materials to an upstairs meeting room for the two-hour class. “We got it started, God blessed it, and we had to be satisfied that, even if no language was learned, they knew I had showed up and cared enough to do that,” Welty said. After a year and a half, the classes grew to the point that the ministry began offering instruction through the nonprofit organization Literacy Advance, in partnership with other nonprofit agencies. The ESL program had a huge impact in connecting people at Los Arcos to Westbury and to resources throughout the community, Terry said. With the Fondren Apartment Ministry as a catalyst, Westbury is no longer a church adrift, as Tommy Williams had sensed in 2010. About 40 to 50 Africans, including children and adults, now regularly attend worship at Westbury and participate in various ministries. That, in turn, has drawn other newcomers to the church, and offered a powerful example to their fellow worshippers. Olivia Nyirarukundo holds hands with Linda Tollefson after services at Westbury UMC. Emile Nsengiyumva, 31, a refugee from the Congo, is a leader at Westbury and a mentor to the church's African youth. Though the church has not seen explosive growth in attendance, giving or other traditional measures since the new ministry began, those numbers are no longer in decline, Fuerst said. African young people are active at Westbury in many ways, partly because the language barrier is not an issue for them. The most visible is a youth choir, organized in September by Emile Nsengiyumva, a 31-year-old from Congo. 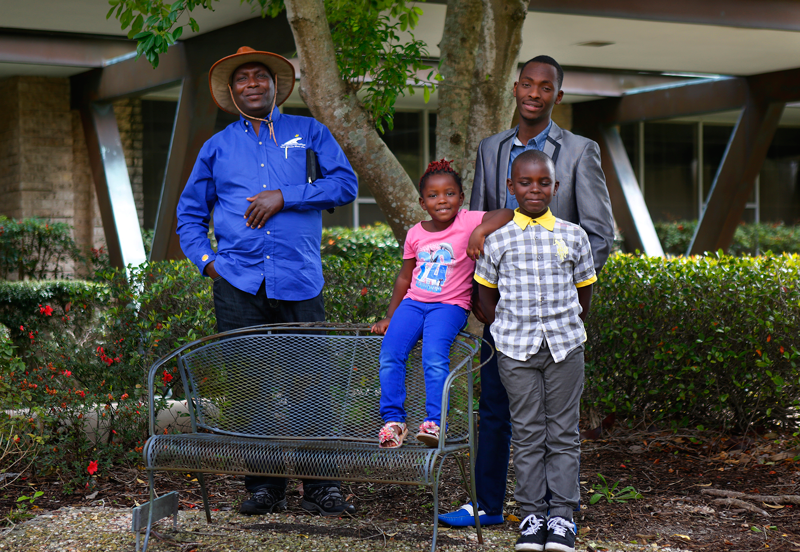 Nsengiyumva, who grew up in a Pentecostal church, threw himself into life at Westbury shortly after arriving in Houston in 2015. Ruhumuriza, the young man who survived the Gatumba Massacre, is a member of the choir, as well as the Fondren Apartment Ministry leadership team, and is an active participant in the young adult Sunday school class. African young people participate in confirmation class, youth group on Sunday mornings and weekend retreats. And when the church dedicated one Sunday morning to acts of service, lending their help to a meal-packaging event and an elementary school cleanup, African families were part of that effort alongside everyone else. Laurie Sturdevant, a longtime Westbury member and the chair of the church council, said the past few years have challenged the church and moved it to a new place. “It’s who we’ve become and who we’re becoming,” she said. Although Terry understands the heart of her work to be rooted in prayer and deep listening, there also are practical concerns. Sustainability was always on her mind -- Terry had spent hours writing grant proposals and seeking funding to support the work. In the early years, the ministry was not part of the church budget but was instead underwritten from other sources, including grants from the Texas Methodist Foundation, the Path 1 Church Planting Residency -- a United Methodist program that supports young church planters -- and gifts from individual donors. Last year, its budget was $82,000. About a quarter of that, 24 percent, came from the church budget; another 18 percent from individual Westbury members over and above their regular church contributions; 8 percent from other individual donors; 30 percent from foundations; 16 percent from partner churches, including St. Peter’s UMC in Katy, Texas; and 4 percent from other nonprofit organizations. Today, the church is exploring the possibility of incorporating the ministry as a free-standing nonprofit, a structure that could allow for greater accountability, financial sustainability and smoother leadership succession, Terry said. And the shape of the Fondren Apartment Ministry continues to shift and change in exciting -- and sometimes unsettling -- ways. In August 2014, the intentional community was joined by newlyweds Russell LaGrone and Erin Randolph, who had been inspired by what they were seeing at Los Arcos and Westbury. And Randolph, who had joined him one Sunday shuttling people between Los Arcos and the church, said she was stirred by the ministry as well. “There were a lot of different people, and nobody spoke the same language, but there was something very powerful about being part of something so multicultural, with all these people trying to worship God together,” she said. 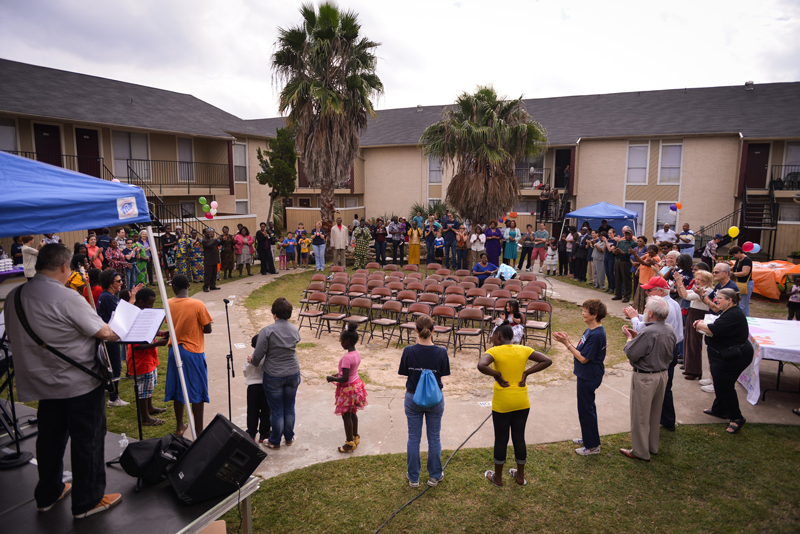 Their home church, St. Peter’s UMC in nearby Katy, became a covenant partner of the Fondren Apartment Ministry, contributing financial and other support. For her part, Terry has worked hard to connect refugees with jobs partners such as Plant It Forward Farms, a nonprofit that creates stable employment for refugees, setting them up with training, tools, urban farm spaces and business support to grow and sell their own produce. But the new initiatives have stretched the ministry’s resources, and in December 2014 they suspended the Wednesday night gatherings at Los Arcos. They plan to begin them again this spring, but just twice a month. Some of the key people are also in transition. The Heathcocks moved out of the intentional community because Lindsey, a second-year medical student, needed to be closer to the hospital as part of her training. But they are still members at Westbury and active participants in the apartment ministry. Mukanya and his family recently moved from Los Arcos. 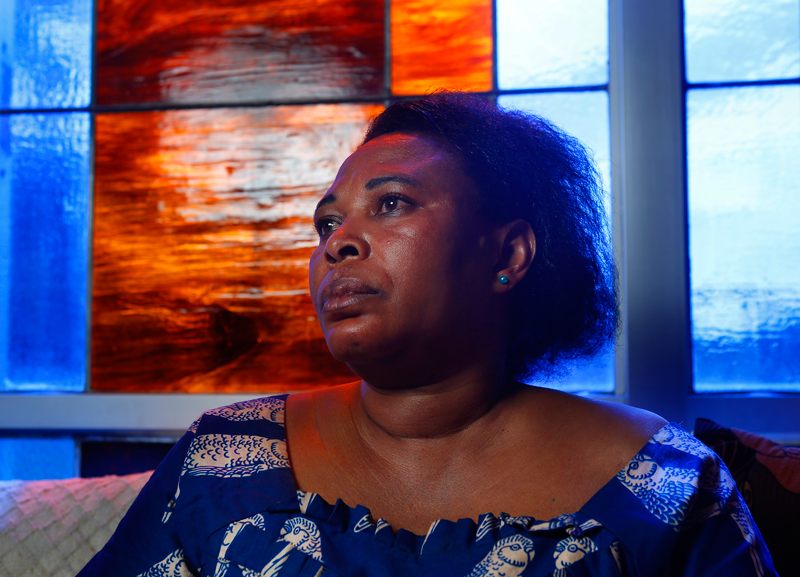 They plan to continue worshipping at Westbury, despite the half-hour drive, but Terry worries that other refugees without reliable transportation might move away and lose their ties to the church. Fuerst recently announced that she is moving to Austin, and Huie is retiring in September. These changes and challenges may give the Fondren Apartment Ministry a tenuous feel, but that is part of the process of showing up and accepting that God is in charge. “There is a deep, palpable sense that we are joining in God’s work, that we are being carried along by the wind and the Holy Spirit, and that that is changing people’s lives by bringing them in contact with one another,” Fuerst said. Terry and Pearl now move with ease through Houston -- at least, as easily as anybody does. Terry’s smartphone is filled with numbers for caseworkers, pastors and others throughout the city. She has been completing her ordination process and expects to be ordained as a deacon in May. She regularly wears cowboy boots, and when she enters one of the many Mexican restaurants in the Fondren area, the waiters recognize her and greet her warmly. Last April, Terry preached at Westbury, assisted by Thony Ngumbu, a Westbury member and a senior official with IEDA Relief, an international aid organization headquartered in Houston. It was a bilingual service, with Terry preaching in English and Ngumbu in Swahili. The text was Matthew 6:5-34, the passage where Jesus tells the disciples not to worry, citing the example of the birds of the air and the lilies of the field. “Have you ever known the feeling of being overpowered by worry?” Terry asked at the outset of the sermon. “Je, umewahi kujisikia unavamiwa na wasiwasi?” Ngumbu translated. Thony Ngumbu and Hannah Terry at the bilingual service. Back and forth the sermon went -- a line in English, then a line in Swahili. For many of the refugees from Los Arcos who attended that Sunday, Terry wrote later, it was the first time they had ever heard a sermon in their own language at Westbury. It was the first time they had really heard a sermon in years. Andrew Kragie and Marlon F. Hall contributed to this story.